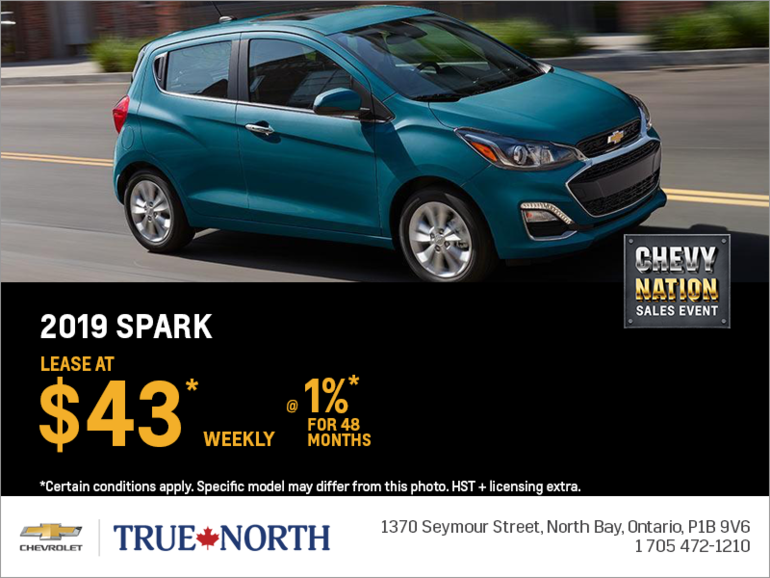 Lease the 2019 Chevrolet Spark starting from $43 weekly at 1% for 48 months with $1,995 down! Or finance it from $43 weekly at 1.99% for up to 84 months with $1,995 down. Offer available to qualified retail customers in Canada for vehicles purchased and delivered between April 2 and April 30, 2019. 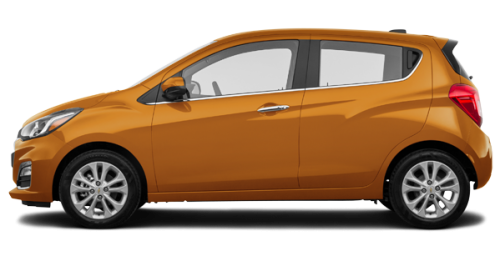 Lease based on suggested retail price of $17,595, includes $1,000 Cash Delivery Allowance (tax exclusive), towards the lease of an eligible 2019 Spark 1LT with Automatic Transmission. Bi-weekly payment is $87 for 48 months at 1% lease rate (1% APR) on approved credit to qualified retail customers by GM Financial. The $43 weekly payment is calculated by dividing the bi-weekly payments. Payments cannot be made on a weekly basis. Equivalent weekly payments are for informational purposes only. Annual kilometer limit of 20,000 km, $0.16 per excess kilometer. $1,995 down payment required. Payment may vary depending on down payment trade. Total obligation is $11,022. Taxes, license, insurance, registration and applicable fees, levies, duties and, except in Quebec, dealer fees (all of which may vary by dealer and region) are extra. Option to purchase at lease end is $5,982. See dealer for details. Credits vary by model. Dealer may sell for less. Factory order may be required. Limited time offer which may not be combined with certain other offers. General Motors of Canada Company may modify, extend or terminate offers in whole or in part at any time without notice. Conditions and limitations apply. Offers may not be redeemed for Cash and may not be combined with certain other consumer incentives. 4 Eligible 2019 Spark 1LT with Automatic Transmission. Offer available to qualified retail customers in Canada for vehicles financed and delivered between April 2 and April 30, 2019. Financing provided, on approved credit, by TD Auto Finance Services, Scotiabank® or RBC Royal Bank. Participating lenders are subject to change. Rates from other lenders will vary. Representative finance example based on a new 2019 Spark 1LT with Automatic Transmission. Suggested retail price is $17,595. $1,995 down payment required. $16,595 financed at 1.99% finance rate (1.99% APR) equals a weekly payment of $43 for 84 months. The offer includes $1,000 Cash Delivery Allowance (tax exclusive). Cost of borrowing is $1,053 for a total obligation of $17,648. Freight ($1,600) and air conditioning charge ($100) included. License, insurance, registration, PPSA, applicable taxes and dealer fees not included. Dealers are free to set individual prices. Limited time financing offer which may not be combined with certain other offers. GM Canada may modify, extend or terminate offers in whole or in part at any time without notice. Conditions and limitations apply. See dealer for details. ®Registered trademark of The Bank of Nova Scotia. RBC and Royal Bank are registered trademarks of Royal Bank of Canada. TD Auto Finance is a registered trademark of The Toronto-Dominion Bank.